In salutation of 2019, Nicole examines the (surprisingly complicated) historical origins of the January 1st New Year. The intro and outro songs in this episode are "Idea" and "Remedy for Melancholy," respectively, by Kai Engel. The whole year will be fortunate for you, not if you are drunk on the new-moon [New Year’ Day], but if both on the new-moon [January 1st], and each day, you do those things approved by God. For days come wicked and good, not from their own nature; for a day differs nothing from another day, but from our zeal and sluggishness. If you perform righteousness, then the day becomes good to you; if you perform sin, then it will be evil and full of retribution. If you contemplate these things, and are so disposed, you will consider the whole year favorable, performing prayers and charity every day; but if you are careless of virtue for yourself, and you entrust the contentment of your soul to beginnings of months and numbers of days, you will be desolate of everything good unto yourself. Happy New Year! I love this time of year. It’s always kind of humbling to write the old year for the last time, and write the new year for the first time. In this case: 2019. 2019! Something about the new year causes me to recognize my human-ness, my small-ness, my creatureliness. It is an awe-inducing sign of something bigger and beyond ourselves–the enormity of time. Today I thought I’d take the opportunitiy to talk about the historical origins of the January 1st New Year. I say the “January 1st New Year” because in Orthodoxy, of course, we have a few different New Year’s to reckon with: the start of the ecclesiastical year on September 1 (the old Byzantine New Year), not to mention the tension between old and new calendar jurisdictions which kind of throws a lot of our dates for a loop sometimes. But anyway—today we’re going to forget those temporal issues for a moment and focus on January 1st, the date on which our culture and society celebrates what’s called the “civil” new year. Where did it come from? In the words of the guys on the Areopagus podcast, January 1st: what’s your deal? I’m Nicole Roccas and this is Time Eternal. The new year, as cultural anthropologist Anthony Aveni once put it, is a “point of entry” into a recurring loop of time that would otherwise be barred from access. Throughout history, human societies have chosen numerous points to exit the old year and step into a new loop of time, from lunar new years to solar, calendrical, religious or civil new years. 1 January is one such point in time. It dates back to the start of the Julian calendar in 45 BC. The Julian (or “old”) calendar officially placed the start of Rome’s fiscal and juridical year on the calends of the first month. This month was named Ianuarius, after Janus, the Roman God of beginnings, gates, transitions, time, duality, doorways, passages, and endings. Ianus did not just hold sway over temporal beginnings and endings, but also the beginnings and endings of conflict, thus he was also revered as the god of war and peace. But most of all, Ianus was known as the god of change and time. He presided over the changing phases of a human lifespan—birth, marriage, death. He was worshipped at the beginnings of harvest and planting times. He symbolized the transitions between past, present, and future. In art, Ianus was and is frequently depicted with a head that has two faces, one in the front and the other in the back—one facing toward the future, the other toward the past. I think this represents, symbolically, the tension between past and future that Ianus represents. So the Romans named their first calendar month after Ianus, seeing it as a kind of ambivalent gateway into the future year (the Romans believed the beginning of anything was a foreshadowing of the whole). Thus the first of this month was consecrated to Ianus and it was not uncommon to exchange gifts and speak kind words—in a sense to bless or guard the whole year against evil. Cakes were made and burned at the altar for Ianus. The real purpose of the Roman new year, however, was not religious but administrative—and, shall we say, recreational. Administratively, it signalled the transition of funds and payments, and also the inauguration of new political officers. Recreationally, however, it coincided with bawdy pagan celebrations—it was customary to extend the saturnalia (i.e. the pagan festivals in honor of Saturn that began on 17 December) into the new civil year. Despite the legalization of Christianity in 325, 1 January retained its celebratory and sometimes even pagan connotations in some areas of the Roman Empire. This, at least, is the sense one gets from several extant homilies written by Church fathers, who repudiated the celebrations. To admonish their flocks in the face of the new year, such clergy members preached special sermons lamenting the new year’s excessive celebrations and encouraging Christians to arrange their upcoming year to allow for spending more time hearing and heeding the Gospel. It’s a thought that, I’m sure, still resonates among clergymen and laity alike. The post-Nicene Church erected a further safeguard against the influence of paganism by gradually pushing the civil New Year back from 1 January to Christmas, increasingly observed on 25 December. In doing so, annual temporal circuits were aligned with the broader, Anno Domini scheme of historical time. Although common knowledge of 1 January as the Roman New Year never fully disappeared, the early middle ages witnessed a flowering of “new” New Year’s dates across Europe. Depending on one’s geographic location, the old Roman new year was replaced by Christmas (25 December), the spring quatember (1 March), the vernal equinox, the Annunciation (25 March), and the autumnal quatember or Byzantine New Year (1 September). In the face of these new new years, the date of January 1 came to be significant for other reasons. In the western Church, for example, it was gradually overshadowed by the feast of Christ’s circumcision (at least since the sixth century observed on the octave of Christ’s birth). Meanwhile, in the eastern realm of the former Roman Empire, the date was most directly associated with the Feast of St. Basil (although the Orthodox Church also observes the Feast of the Circumcision on January 1 as well). This flowering of new years subsided in the late middle ages. During that time, there was a profound shift towards what historians call the “Circumcision style” civil New Year’s on 1 January. The precise details and impetus for this shift are not fully understood, though it was likely an effort to harmonize the many different New Years floating around in medieval Europe. Whatever the case, an organic transition that saw the New Year gradually remitted to 1 January occurred between the twelfth and early seventeenth century. Of course there’s more to this history, especially in the Orthodox world—how did the Byzantine New Year originate and evolve? How did the advent of the New Calendar affect new years dates across Europe? But really all I wanted to do today was to give some insight into where our celebration of January 1 comes from. And with that, I’ll sign off and wish you all a blessed and happy New Year! 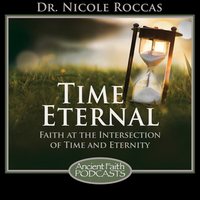 Make sure to subscribe to this podcast and stop on by the Time Eternal blog for more thoughts and resources for the New Year. May God teach us to number our days aright that our hearts may be bound with wisdom. Thank you and God bless.